What is scandalous? What is bold? Unlike the Paris audience of May 1913, here in Tel Aviv we are accustomed to dissonance, perhaps too much so. 100 years after the premiere of Vaslav Nijinsky’s choreography to Igor Stravinsky’s Rite of Spring, the work that caused a riot in the theatre has become canonic, its music familiar, the choreography aesthetic and mild in comparison with what might be seen on dance stages today. Last night in Tel Aviv, the Gvanim BeMahol (Shades of Dance) choreography competition opened with a tribute to this influential and controversial work. The bi-annual event will focus on the theme of ritual and ceremony this year, under the artistic direction of Idit Herman, in celebration of the 100th anniversary of Rite of Spring. A work of art is bold in its inception and creation; the scandal it evokes is dependent upon its reception. Art is daring in its independence of reception. Shocking the audience does not necessarily imply courage on the part of the artist. On the contrary, confronted with an audience that desires and expects to be shocked and titillated, a work that sets out to break taboos and stun audiences with extreme imagery is merely working within the conventions of contemporary popular culture. The seriously seditious artist finds ways of working with and within conventions, undermining and confounding expectations explicitly and implicitly within the work itself, in a performance so brilliantly executed and enthralling that the viewer is mesmerized, heart racing, mind dazzled. Hillel Kogan is that kind of artist. The dancer/choreographer has a body of work that is riotously subversive entertainment, musical in the extreme, funny, precise, political, philosophical, and dangerously seductive. Kogan is an endlessly versatile performer and creator with a volatile imagination capable of igniting several revolutions at once. Kogan’s Rite of Spring (which premiered at Intimadance 2011) works intimately with Stravinsky’s score, immersing quotes of Nijinsky in original choreography, all within the context of contemporary Israeli symbols and rituals, questioning everything. It is all too tempting to say that nothing is sacred these days, it is far more rigorous to examine our culture closely and ask: what is sacred, and why? Taking on a succession of diverse roles and personae, Kogan is both the bride and the brutish boxer, the bereaved mother and the stalwart soldier, belly dancer and faun. Working on a bare stage with a black box of props at each side, Kogan is completely exposed, yet the transitions are almost invisible. Fast, yet not frantic, he shifts from one persona to another, immersing himself entirely in the character. The images reflect the local culture, while the choreography quotes from Nijinsky (also from L’apres-midi d’un Faune) and other choreographers of the modern era whose movements resonate in the mind. One need not identify the specific work or artist, they are familiar because they have become part of our collective concept of “dance.” Kogan presents the viewer with the familiar in order to question that which is so obvious that is has become invisible. Kogan insinuates a splendid irony into each moment; the scintillating dance between appearance and reality; he is and is not as he appears to be. 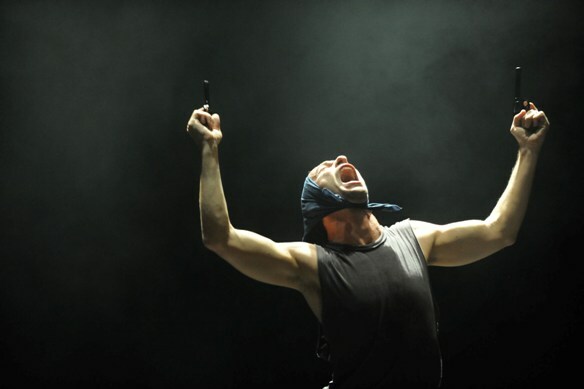 Quality and precision are the ballast for the wild irreverence and freedom of Kogan’s brilliant performance. The patriotic glow and loving flow of his movements as he holds a small Israeli flag in each hand, his very being at one with the waving flags, is not a counterfeit, it is the image of patriotism. It is beautiful and seductive. Kogan dances a small, joyful dance with the flags, spinning, prancing, exuding innocence and then becoming more ecstatic, rubbing the flags on his body, stuffing a flag in his mouth and jumping, flag between his teeth. Don’t blink during this performance. Seconds later he is bellowing out a medley of Hebrew songs into a megaphone, mano a mano with Stravinsky. 100 years after the premiere of Rite of Spring, it often seems more difficult to capture the audience’s attention, let alone move or provoke them to think and question. Kogan boldly exposes the rituals of contemporary Israeli culture with wicked humor, intelligence and imagination. I can think of no better tribute to that revolutionary work than Hillel Kogan’s Rite of Spring. Hillel Kogan is a name that should be writ large in the chronicles of Israeli dance. Gvanim BeMahol (Shades of Dance) choreography competition will take place from August 29 – 31, 2013. Read more about Gvanim here and here. Tickets may be ordered online, or call: 03-5105656.